What Do Swallows Eat on a Cold Windy Day? Today was a cold blustery day, on the heels of some severe weekend storms. I went down to check on our prairie (five inches of rain, strong winds, and a tornado a few miles away) and was glad to see everything looked wet but ok – including the cattle. As I walked through the prairie, I noticed some barn swallows flying and hovering just above the surface of the wetland/pond. Since the temperature was in the low 40’s and the winds were howling above 30 mph, I didn’t think there was any chance there were flying insects for them to catch and eat, so I wondered what they were up to. As I watched the swallows, I realized they weren’t just wasting energy, but instead appeared to be feeding by picking insects (I assume) off the surface of the water. It was lightly raining and I’d left my camera in the truck, so I didn’t take any pictures, but I’d never seen nor heard of such behavior before. About a half hour later, I had just left the prairie and was starting home when I saw a big mixed flock of cliff and barn swallows behaving very similarly in a flooded wetland about a mile from our prairie. The rain had stopped by this time, so I pulled over and got a few mediocre photographs. 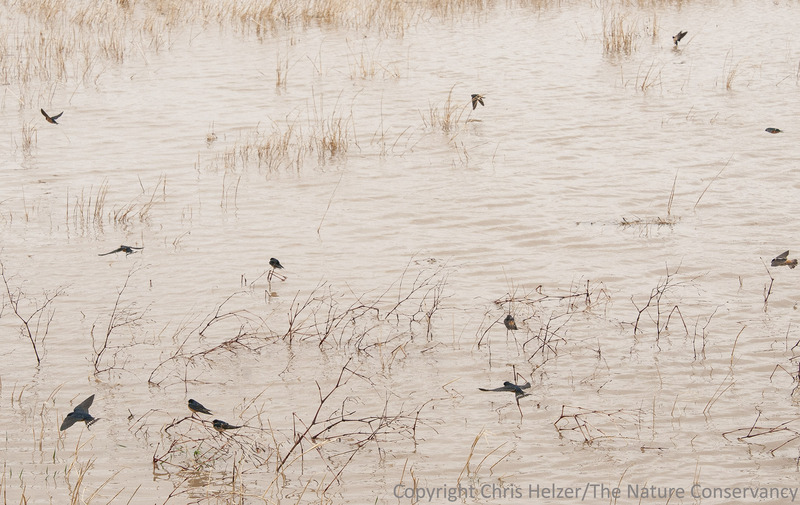 Swallows resting and flying over a wetland on a cold blustery spring day. A wider shot, showing one swallow in the top right corner that I think was feeding. When I got back to town, I did a little quick research and found that this kind of feeding behavior has been seen before – it was just new to me. However, I also remembered a long cold period in May back in 1996, during which scientists documented mass deaths of swallows from starvation. At the time, I remember being told that the birds starved because of a lack of flying insects to eat during the cold spell. I wonder why those swallows died but the ones I saw today (two different species a mile apart) appeared to be finding food…? I also wonder if they were catching enough food to cover the energy costs of doing so? It’s a good day when I can learn something new AND come up with questions I can’t answer. Anyone out there have answers for me? This entry was posted in Prairie Animals, Prairie Natural History, Prairie Photography and tagged cold weather, eating, feeding, feeding from water, feeding on water, floating insects, spring, swallows, windy by Chris Helzer. Bookmark the permalink. Interesting. 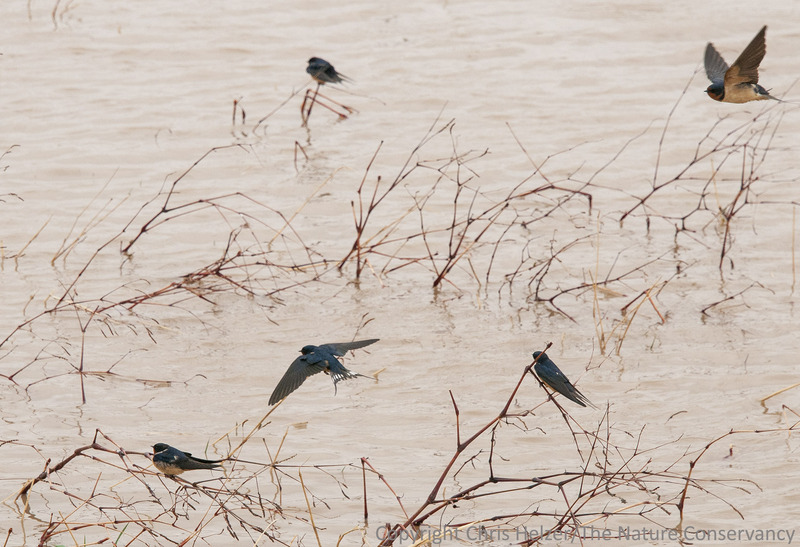 A couple of weeks ago, when it was gray and around 50F, I saw this same behavior over our biggest wetland at Shaw Nature Reserve, a big group of cliff swallows plus a few barn swallows flying around over the 35-acre water surface, (I thought) wasting energy. Are you certain that all of the swallows in your photos are Cliff Swallows? I believe they are a mixed flock of Cliff and Barn Swallows. In photo #1, the center and right bird in the group of three in the lower portion of the photo look like Barn Swallows (see tail shape and markings of the center bird). Gary – good eyes! I think you’re right. I’ll edit the caption to reflect that. Thanks! A number of insects “hatch” from the water surface driving both fish and flying predators crazy. Any good trout fisherman should be able to identify the genus of insect for you. If you really want a good show you should visit the wetlands at dusk. This is when many insect hatch trying to avoid predatation. The swallows are neat. However, I think bats swooping down and picking insects off the surface of the water has an even larger ‘cool’ factor. Our barn swallows were crazy today in the cold, post-storm weather. They were swarming around our old farmhouse next to a lake, picking insects off of the siding and windows. It gave my cats, and me, quite a delight! First time I had seen this behaviour since moving here. Just the right conditions, I guess. I have watched large concentrations of mostly tree swallows, with some barn swallows , violet- green swallows, and cliff swallows joining in, over our wetlands this spring. They appear to be actively feeding. Largest concentrations have occurred in the evenings with a good breeze blowing and when I had noticed a good midge hatch occurring that day. Midge species often emerge as adults from wetlands in some colder conditions. Midges are small and not easily noticed until they form “midge clouds” of breeding adults. The breezy conditions were concentrating the midges in to wind eddies formed by a ridge, emergent wetland vegetation, and other wind barriers. Colder conditions eliminated most other available insects, leaving a bellyful of midges or going to roost hungry the choice. That was my explanation anyways. I see this activity almost yearly at Wehrspann/Chalco Hills in Sarpy County. It is especially prevalent in Eastern Phoebes and Tree Swallows, species that often return to Nebraska when temperatures at night and occasionally during the day do not get above freezing. If the lake is thawed, the water temperature is usually above freezing and both insects and birds are flying and feeding in the warmer temperatures. As for the 1996 swallow die-off, I would recommend reading Charles Brown’s “Swallow Summer” published by the University of Nebraska Press in 1998 and available off Amazon for less than $20. Dr. Brown at that time had been working with Cliff Swallows at Cedar Point Biological station for over 15 years and tells a very compelling story of the 1996 event.